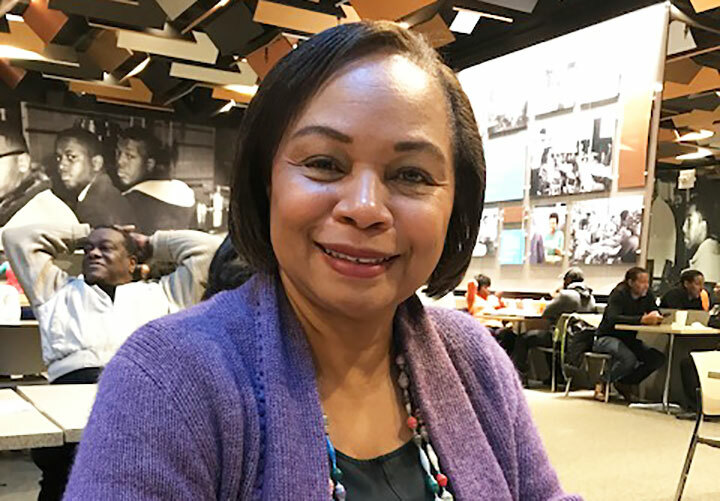 Assistant Dean of the School of Journalism and New Media Patricia Thompson was honored as Educator of the Year at the 33rd annual Southeast Journalism Conference last weekend. 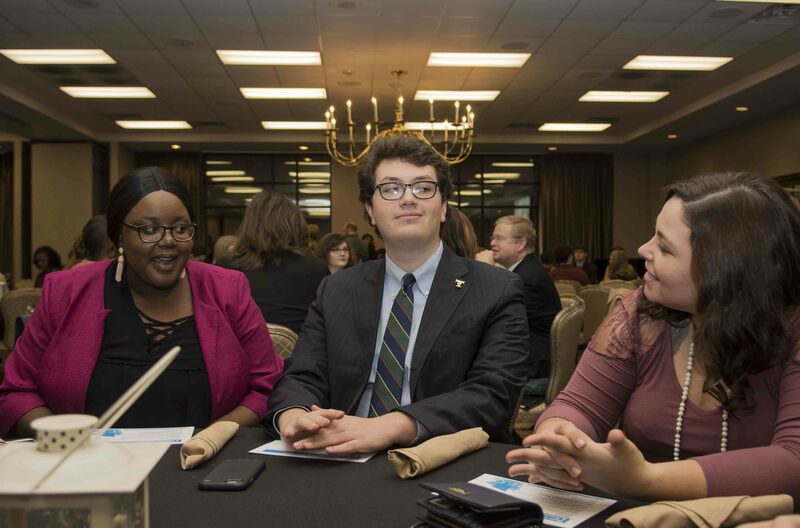 Middle Tennessee State University hosted the 2019 conference in Murfreesboro, Tennessee, with over 300 students and advisers in attendance. Thompson was nominated for the honor by current and former students, and she was chosen by a committee of the three most recent recipients of the award. After graduating from the University of Missouri, Thompson worked for The Washington Post and taught at Northwestern University. She was also a part of the San Jose Mercury News staff that was awarded the 1990 Pulitzer Prize for general news reporting. University of Mississippi students also won awards in the two regional contests sponsored by the conference. The Best of the South contest honors the work of student journalists from throughout the previous year, and the on-site competitions gave students the opportunity to compete on deadline during the conference. In the Best of the South competition, The Daily Mississippian was awarded fifth place for Best College Newspaper. It was the only daily newspaper competing for Best of the South. Also in the Best of the South contest, NewsWatch Ole Miss’s Madison Scarpino won first place for TV hard news reporting. Second place Best of the South awards included Devna Bose for feature writing, Elizabeth Blackstock, Katie Campbell and Jessi Dressler for journalism research paper and Rebel Radio for radio news audio program. Third place awards included Hayden Benge for news graphic design, DeAndria Turner for radio journalism and Rebel Radio for radio station. Other individual awards included: Mary Clair Kelly, who won fifth place for TV news feature reporting; Slade Rand, who won sixth place for news writing; Liam Nieman, who won seventh place place for arts and entertainment writing; Jaz Brisack, who won seventh place for opinion-editorial writing and Brittany Brown, who won eighth place for College Journalist of the Year. In addition to 13 Best of the South awards, the University of Mississippi also won second place for the Grand Championship of on-site competitions with seven individual wins. Matthew Hendley won first place in the on-site competition for TV anchoring, and Hayden Benge, Hailey McKee and Davis Roberts won first place as a team for public relations. Second place awards went to Devna Bose for feature writing and Abbie McIntosh and Madison Scarpino for TV reporting. Third place awards went to Liam Nieman for arts and entertainment writing and Slade Rand for news writing. 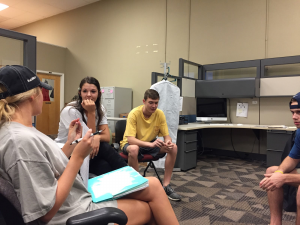 This story was written by Hadley Hitson and originally published in The Daily Mississippian. Congratulations to Matthew Hendley and Madison Scarpino for winning first-place awards in Southeast Journalism Conference competitions. 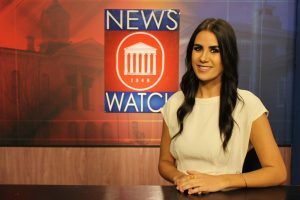 Hendley, a NewsWatch Ole Miss anchor and correspondent, won first place in the SEJC onsite anchoring competition. Judges said the entries were unusually strong this year, and Hendley, a sophomore, came out on top. Scarpino, a junior, was named Best TV Hard News Reporter for packages that aired on NewsWatch Ole Miss last year about Hurricane Michael and the Journalism and New Media forum after Ed Meek’s Facebook post. Scarpino was social media producer for NewsWatch last semester. JNM Professor Nancy Dupont is NewsWatch adviser and has worked with both students. The SEJC conference was February 14-16 at Middle Tennessee State University in Murfreesboro, near Nashville. For the anchoring onsite category, Hendley was given about 10 minutes to read the script, and then he went on the air for about five minutes reading the script and doing a sign-off in a virtual newsroom. It was a mini-newscast with four or five local Tennessee stories, requiring him to switch from one camera to another after the anchor intro. Abbie McIntosh, NewsWatch Ole Miss student manager, shared a second-place award with Scarpino in the onsite TV reporting team category. It took Becca Brown only three months to prove she was ready to be advertising sales manager for the Student Media Center. 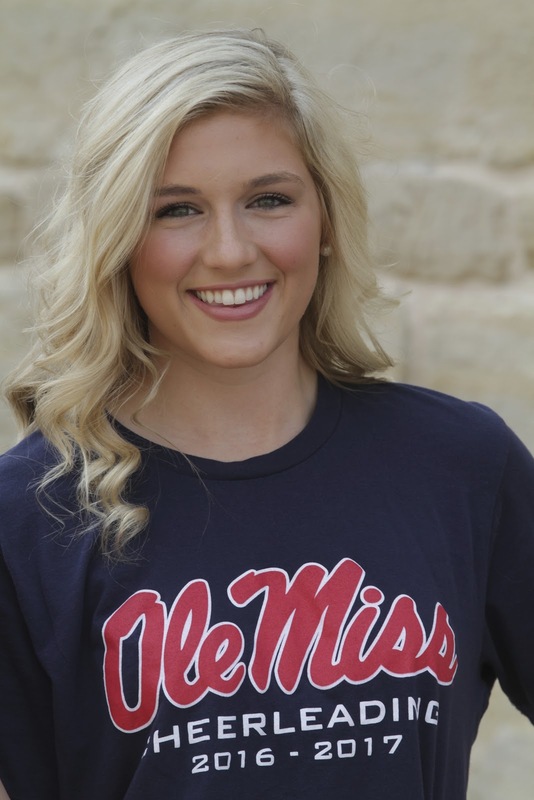 Brown, a junior marketing major from Yoakum, Texas, is a former Ole Miss cheerleader. 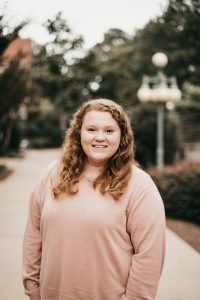 Her goal for this year: to increase the profitability of the SMC’s publications, broadcasts and websites, and to increase the brand’s recognition around campus and in Oxford. “The most successful person in the company gets told no 95 percent of the time, but they are making more calls than anybody else,” Brown said. Roy Frostenson, SMC advertising adviser, describes Brown as focused, ambitious and goal-driven. “She’s dedicated to helping the Student Media Center expand our advertising revenues, especially our digital and broadcast sales,” Frostenson said. Brown said a friend recommended she apply for a sales position, and she is glad she did. She supervises a staff of five account executives. “My favorite part is that I’m really kind of treated like an adult when I go to my clients because a lot of times they don’t realize that we are in college,” Brown said. “And that’s something that I have never really gotten before in any other job. They treat me like I’m on the same level as them. They treat me with professionalism and I do the same with them. Brown worked for the Edward Jones investment company in Texas last summer, and she hopes to return to work there next year. Her long-term goal is to open her own office as a financial adviser. 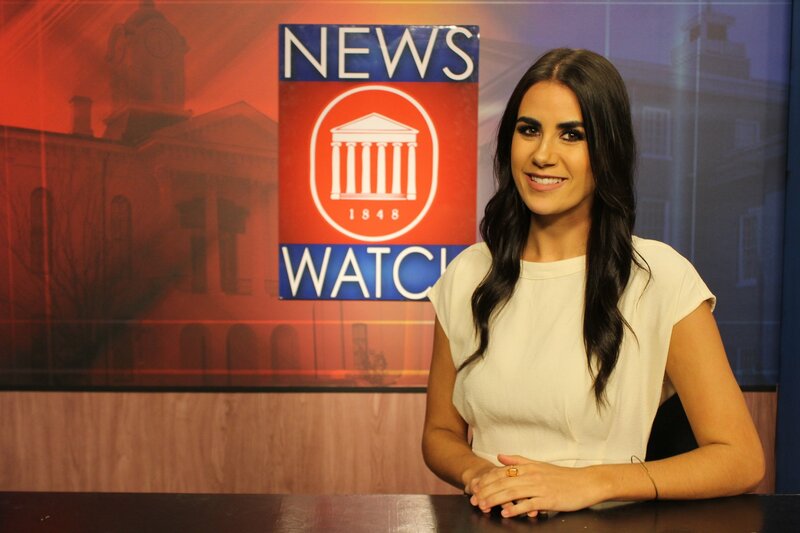 Abbie McIntosh is in her second year as station manager for NewsWatch Ole Miss. Rarely does a student serve two years in the top position. Nancy Dupont, journalism professor and NewsWatch Ole Miss faculty adviser, said she was delighted McIntosh applied to be station manager again this year. McIntosh is focusing on working with her team to deliver the best show possible Monday through Friday evenings. She is in charge of a staff that includes more than 30 producers, directors, anchors and correspondents. They are in the newsroom each afternoon producing a live, 30-minute newscast for Lafayette County that is broadcast on Channel 99 and is also available on websites and via livestreaming and social media. “I hire them in September, and I want them to walk out in May better than they were when they walked in the door. Hopefully, I can help them achieve that,” McIntosh said. 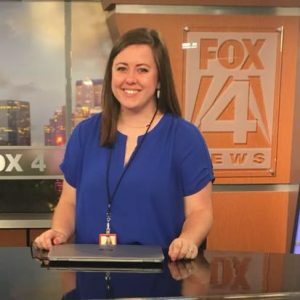 This senior broadcast journalism major from Cypress, Texas, is a big fan of breaking news and highlights the December 1, 2017, newscast as her all-time favorite. The award-winning show featured breaking news about sanctions against Ole Miss Athletics and its football team. was one of three broadcast students who traveled to Florida to report on rebuilding efforts after Hurricane Michael. In summer 2018, McIntosh landed an internship with KDFW Fox 4 in Dallas. Her eyes were opened to all that it takes to get a newscast on the air and it strengthened her passion for the buzz of the newsroom. When she graduates in May, McIntosh plans to work as a television producer. 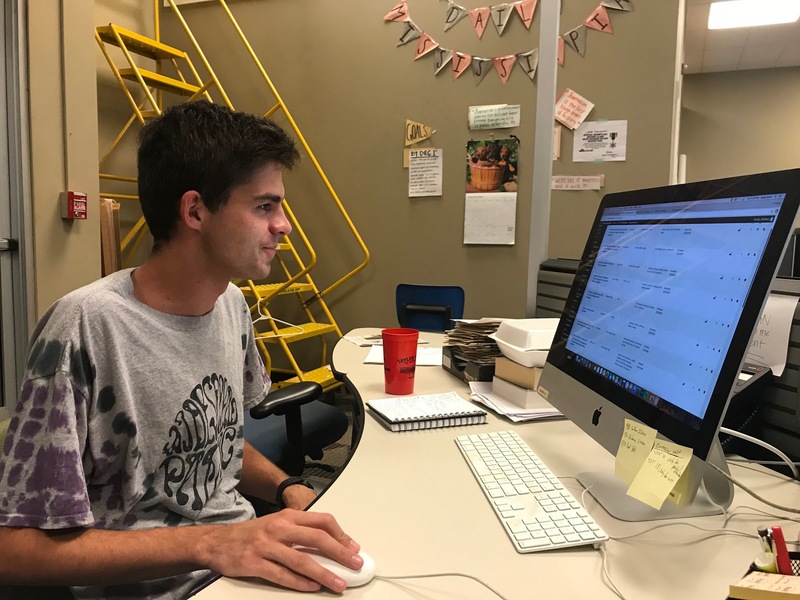 Since the day he was introduced to Assistant Dean Patricia Thompson at the Student Media Center, Slade Rand has been hard at work at The Daily Mississippian. Rand initially was an integrated marketing communications major, but switched to journalism at the end of his sophomore year when he realized how passionate he had become about reporting and writing. He honed his skills by participating in three depth reports in Mississippi and Sri Lanka, led by journalism instructor Bill Rose. 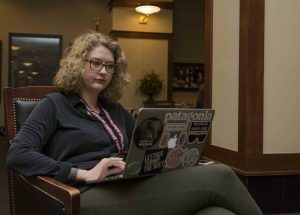 This year, Rand, now a senior, leads a staff that includes about 15 student editors and several dozen writers, photographers and editorial cartoonists. Faculty adviser Thompson said Rand has put together a “dream team” of very talented editors who have done an outstanding job covering major breaking news stories in an unusually busy fall semester, and planning and producing special sections tied to important issues. This Oxford native did not have to go too far away from home to find her passion. She found it at the Student Media Center. Ross, yearbook editor-in-chief, wants to focus on the campus’ hidden gems and continue increasing the online presence of the yearbook. 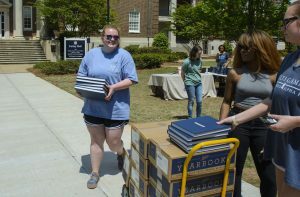 Ross hopes students are keeping up the yearbook’s social media networks, where content is frequently updated. Students can see photo galleries and stories that might not make it into the printed book. Assistant Dean Patricia Thompson said Ross is a top-flight designer, a strong leader, and super organized. Ross’s staff includes assistant editors, writers, photographers, designers and artists. Thompson said it has been fun to watch how well student managers have worked together this year. Ross is president of the campus Society for News Design chapter. She also was part of the Hurricane Harvey team that placed in the Hearst competition, and she won SND awards for digital storytelling for the Harvey project and for her magazine cover for the Sri Lanka depth report. Ross said her plans for her post-graduation future change almost every day, but she knows that as long as she has a career where she creates graphic designs that inspire others, she will be happy. DeAndria Turner got her start in Rebel Radio in her freshman year. Turner, a junior broadcast journalism major, serves as manager of the entire station this year. The Gautier, Mississippi, native wants to make Rebel Radio more known on campus to a wider variety of students. She is proud of the staff’s diversity, in its staffing and in its programming, which features an eclectic variety of rap, oldies, underground, indie and even life-advice shows on 92.1 FM. Turner covers events in Memphis commemorating the 50th anniversary of the assassination of the Rev. Martin Luther King Jr.
Turner fondly remembers that during her freshman year, Leah Gibson was station manager and appreciated Turner’s persistence. Today, it is one of the adjectives Turner uses to describe her strengths, and she is thankful to have been given the space to tell others’ stories on Rebel Radio. This past summer, during her internship with WMC Action News in Memphis, Tennessee, Turner gained experience working on the digital team, shadowing reporters and even doing her own reporting. 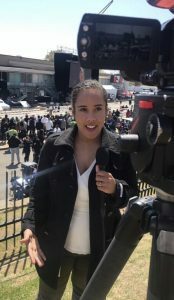 It was an exhilarating experience, and Turner said the most important things she learned were to take initiative and stay flexibility in order to be a well-rounded reporter. 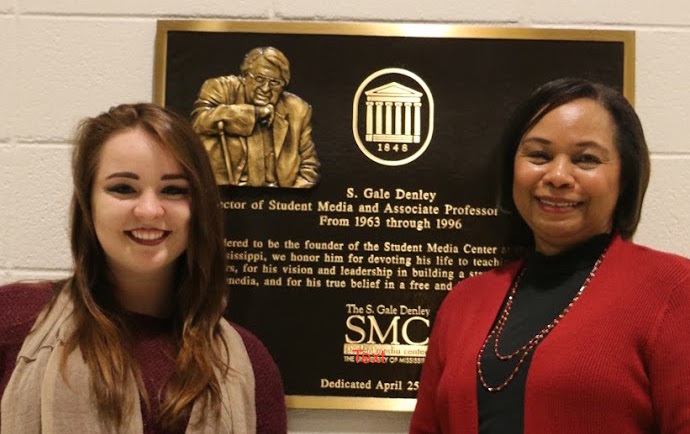 Turner plans to return to Rebel Radio as News Director during her senior year, as she prepares to get an on-air local news broadcast job after college. DM Managing Editor Devna Bose Chosen for Reporting Workshop in Washington, D.C.
Devna Bose, Meek School journalism major and Daily Mississippian Managing Editor, was selected by the Chronicle of Higher Education for its reporting workshop in Washington, D.C. During the workshop, which took place on September 6 and 7, Devna networked with talented editors and student journalists from all over the nation, and learned tips for reporting about higher education, like how to read find and read college form 990s. The Chronicle paid all expenses for the students selected. In the photo at the top, she is getting help finding resources for a story from one of the Chronicle editors. The photo below is of all the students participating in the workshop. 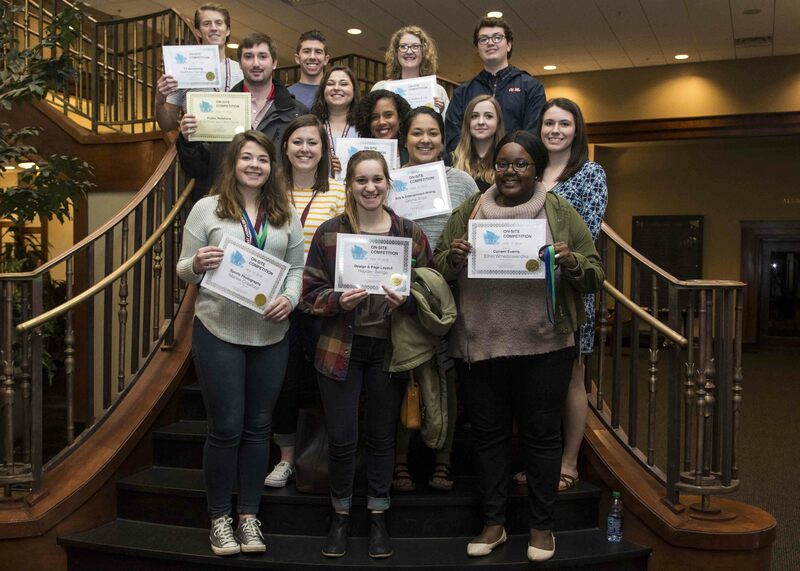 University of Mississippi students won 25 awards in two major regional contests this past weekend, and were named the 1st Place Journalism Champions for the on-site competitions. 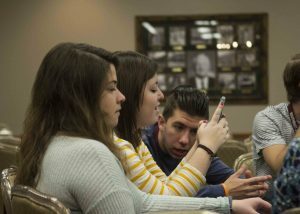 The Southeast Journalism Conference 32nd annual convention was February 15-17 at Harding University in Searcy, Arkansas. SEJC has more than 40 member universities in seven southeastern states, and sponsors two contests. The Best of the South contest recognizes the best student journalist work published or broadcast in 2017. In this year’s contest, there were 412 entries from 30 universities. 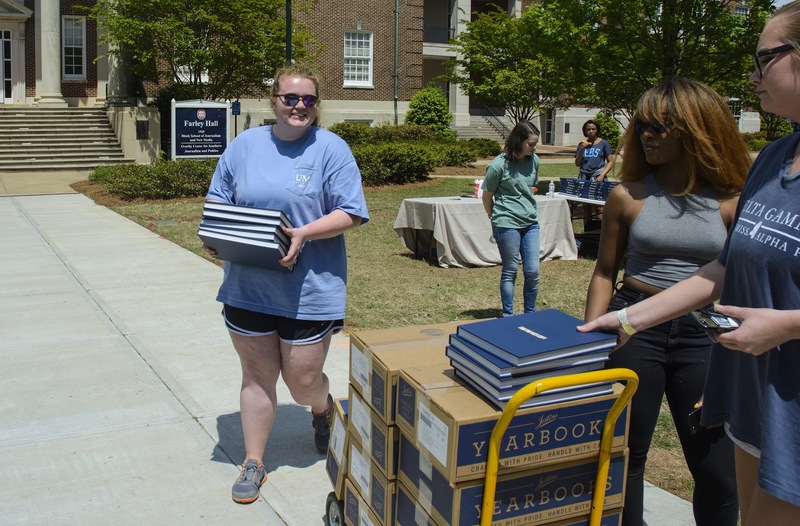 Each UM entry consisted of several examples of student and staff work, from The Daily Mississippian, NewsWatch Ole Miss, Rebel Radio, internships and published projects. The on-site competitions are held during the conference, and students in attendance compete against one another to produce content on deadline in 15 separate categories. Harding reported that 170 students competed in the on-site competitions this year. Meek School of Journalism and New Media students won five first-place awards. In the onsite competitions, first places were won by Devna Bose for arts and entertainment writing; Marlee Crawford, for sports photography; and Ethel Mwedziwendira, for current events. In the Best of the South contest, Abbie McIntosh won first place for Best TV Hard News Reporter, and Thomas DeMartini and Austin Hille teamed to win Best Broadcast Advertising Staff Member. Second places in Best of the South: Lana Ferguson, Best News Writer; Lana Ferguson, Best Feature Writer; Madison Heil, Best Journalism Research Paper; Erin Pennington, Best Radio Hard News Reporter. Second places in the o-site competitions: Hayden Benge for newspaper design; Clifton Carroll for public relations; Marisa Morrissette for media history/law/ethics. Third places in Best of the South: Jake Thrasher, Best News-Editorial Artist/Illusterator; DeAndria Turner, Best Radio Journalist; NewsWatch Ole Miss, Best College TV Station. NewsWatch is a live, daily newscast, compared to some others in the competition which are weekly recorded and edited shows. Third places in the on-site competitions: Matthew Hendley for TV anchoring; DeAndria Turner for radio reporting. In the Best of the South contest, some of the categories – especially the newspaper categories – attract more than 30 entries each and awards are given out up to 10th place. Other UM students/staffs who placed in Best of the South: The Daily Mississippian, a daily newspaper competing against student newspapers published weekly or semiweekly, won fourth place for Best College Newspaper; Marlee Crawford won fifth place for Best Press Photographer; NewsWatch Ole Miss won fifth place for Best College News Video Program; Devna Bose won sixth place for Best Arts and Entertainment Writer; Ethel Mwedziwendira won seventh place for Best Newspaper Page Layout Designer; Hayden Benge won eighth place for Best Newspaper Page Layout Designer; Grant Gaar won eighth place for Best TV News Feature Reporter; Liam Nieman won eighth place for Best Opinion-Editorial Writer. Fifteen UM students traveled to Arkansas to participate in the onsite categories, accompanied by Meek School Assistant Dean Patricia Thompson, who oversees all of the Student Media Center. 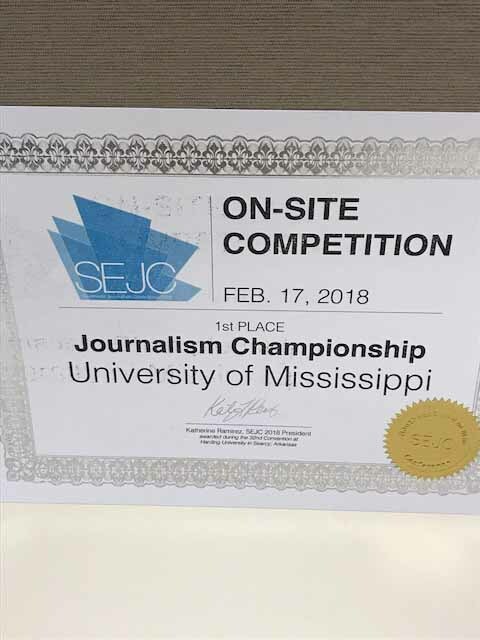 This is the sixth time in the past eight years that UM students have won SEJC’s on-site journalism grand championship award. 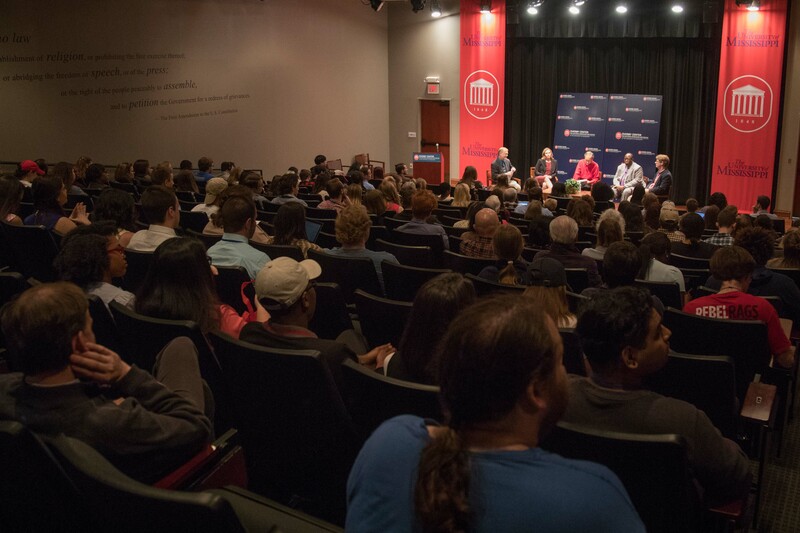 University of Mississippi students were ineligible to compete in the on-site contest last year because the Meek School of Journalism and New Media was the host for the 2017 conference in Oxford. SEJC’s Friday night awards banquet speaker was Sonia Nazario, who won a Pulitzer Prize for feature writing and other national awards for “Enrique’s Journey” when she was a Los Angeles Times staff writer and is now an author, activist and frequent New York Times contributor. The conference did not have an overall theme, but it included workshops and panels focused on digital content, engaging audiences, broadcast storytelling, yearbook journalism, how to cover campus hazing issues, photojournalism, design, and a look back at the Little Rock Nine and the role journalists play in documenting stories about marginalized people. 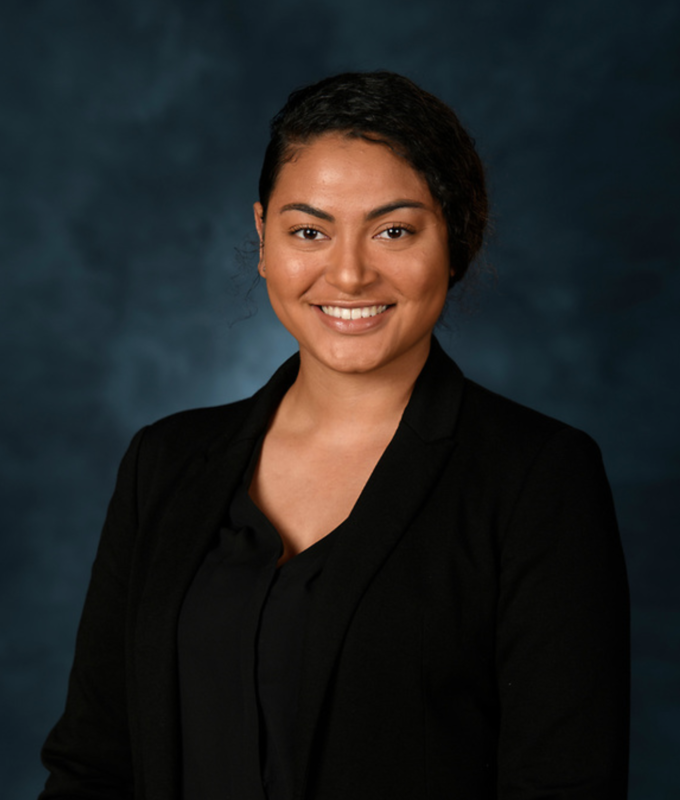 Meek School major Brittany Brown is one of 26 students from 19 universities selected to participate in a major national investigation into hate crimes in the U.S. as part of the 2017 Carnegie-Knight News21 multimedia reporting initiative. Brittany is a junior from Quitman, majoring in broadcast journalism with a minor in Spanish. She is in the Sally McDonnell Barksdale Honors College and a digital content producer, anchor and correspondent for NewsWatch Ole Miss. 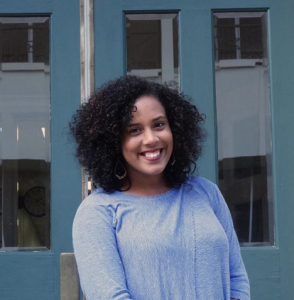 She was an intern at WTOK-TV in Meridian and a research intern in the Ronald E. McNair Post-Baccalaureate Summer Research Program, and she is co-president of the University of Mississippi Association of Black Journalists. Headquartered at Arizona State University’s Walter Cronkite School of Journalism and Mass Communication, News21 was established by the Carnegie Corporation of New York and the John S. and James L. Knight Foundation to demonstrate that college journalism students can produce innovative, in-depth multimedia projects on a national scale. Students from journalism programs across the U.S., as well as Canada and Ireland, will join Cronkite students for the 2018 investigation. They will examine the major issues surrounding hate crimes in America. The students are participating in a spring semester seminar in which they are conducting research, interviewing experts and beginning their reporting. The seminar is taught in person and via video conference by Leonard Downie Jr., former executive editor of The Washington Post and Cronkite’s Weil Family Professor of Journalism, and News21 Executive Editor Jacquee Petchel, a Pulitzer Prize-winning journalist and former senior editor for investigations and enterprise at the Houston Chronicle. “We chose hate crimes and hate incidents as this year’s timely News21 topic because of the apparent increase throughout the country of such acts – from bullying and vandalism to assaults and murders – involving racial, religious, nationality, gender and sexual orientation bias,” Downie said. 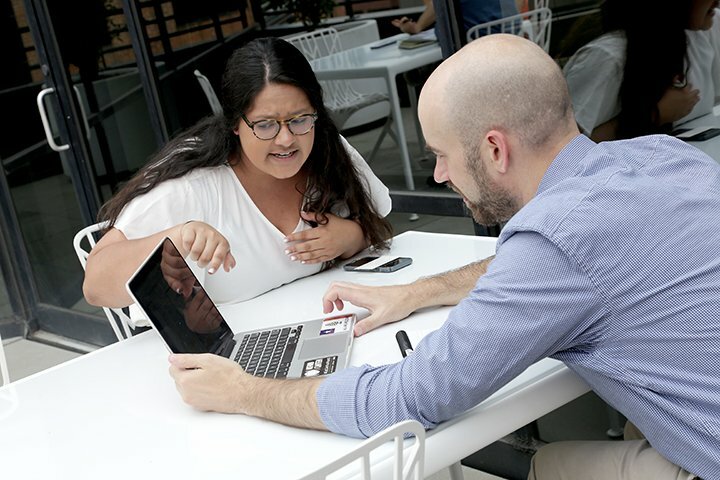 Following the seminar, students move into paid summer fellowships, during which they work out of a newsroom at the Cronkite School in Phoenix and travel across the country to report and produce their stories. Over the past eight years, Carnegie-Knight News21 projects have included investigations into voting rights, post-9/11 veterans, marijuana laws and guns in America, among other topics. The projects have won numerous awards, including four EPPY Awards from Editor & Publisher magazine, the Student Edward R. Murrow Award for video excellence, and a host of honors from the Society of Professional Journalists and the Hearst Awards Program, considered the Pulitzer Prizes of collegiate journalism. · George Washington University, School of Media and Public Affairs, Washington, D.C.
· Syracuse University, S. I. Newhouse School of Public Communications, Syracuse, N.Y. The John S. and James L. Knight Foundation provides core support for the News21 program. Individual fellows are supported by their universities as well as a variety of foundations, news organizations and philanthropists that include the Ethics and Excellence in Journalism Foundation, Hearst Foundations, Donald W. Reynolds Foundation, International Ireland Funds, The Arizona Republic, The Dallas Morning News, Myrta J. Pulliam, John and Patty Williams, and Louis A. “Chip” Weil. Clara Turnage, who graduated from the University of Mississippi in May, has won The Chronicle’s 2017 David W. Miller Award for Young Journalists, which is presented annually to the top intern who worked at The Chronicle during the previous year. The $3,000 award, now in its 15th year, recognizes Ms. Turnage for articles she wrote during her internship this past summer. She is now a reporter at The Natchez Democrat, in Natchez, Miss., where she covers education and crime. Members of the committee that chose Ms. Turnage for the award cited her for the diversity of the three articles she had submitted for consideration, showing her talent for breaking-news, enterprise, and investigative journalism. Committee members also noted her writing style, marked by vivid language, a strong sense of structure and tempo, and, in one case, a willingness to simply let documents speak for themselves. One article, filed from Charlottesville, Va., described the violence that struck the University of Virginia’s hometown when white supremacists, gathering for a rally, clashed with counterprotesters over plans to remove the statue of a Confederate general. Ms. Turnage had traveled to Charlottesville to report for a different article, but she quickly shifted from that story to the one unfolding in the streets. She not only filed a series of lucid dispatches under deadline pressure but also took photographs, including one showing a balding counterprotester, carrying a cane and an umbrella, who is sprawled on the ground as he is beaten by club-wielding young toughs. The award commemorates David W. Miller, a senior writer who was killed by a drunken driver while returning home from a reporting trip. She was also recognized for a lengthy article exploring why the provost of Texas A&M University at College Station had been fired, in July. The answer was not clear. Among the possible reasons were an audit report that found a possible conflict of interest involving the provost’s spouse, a difference of opinion between the provost and the chancellor, and mysterious “enemies” at the university. Ms. Turnage pursued the story tenaciously and provided The Chronicle’s reader with hints even as a definitive answer eluded her. The committee said she must have walked a legal tightrope in trying to find out what had happened, and had structured the story so as to sustain readers’ interest until the end. Finally, she was honored for an article about the unusually difficult mental-health challenges facing international students on American campuses. Many such students, taking pressure-packed course schedules and coming from cultures that still stigmatize mental illness or even regard it as fiction, are reluctant to seek help. She handled this sensitive topic, in part, by winning the confidence of a Chinese student who was recovering from depression and anxiety and who was willing to provide a window into her struggles. The article also described how colleges are trying to help such students. In an interview, Ms. Turnage called this story “the highlight” of her internship. While a student, Ms. Turnage worked at The Daily Mississippian, the student newspaper, rising to editor in chief. She majored in journalism, with a minor in computer science. She says she likes working now at The Natchez Democrat, where she writes two to four articles a day, because of “the impact of a community newspaper on its city.” Community newspapers’ personal contact with local people results in better journalism than can usually be gleaned from telephone interviews, she says. The Miller Award commemorates David W. Miller, a senior writer at The Chronicle who was killed in 2002 by a drunken driver while returning home from a reporting trip. Mr. Miller, who was 35, left a wife and two young children. In presenting the award, the Chronicle committee seeks to identify promising young journalists who exemplify the traits and values that Mr. Miller brought to his journalism: a passion for people and ideas, a zeal for good writing, and a commitment to balance and fairness. University of Mississippi students earned 18 awards at the Southeast Journalism Conference awards ceremony Friday night, including a first-place honor for Public Service Journalism for The Daily Mississippian’s “The Red Zone” special edition. 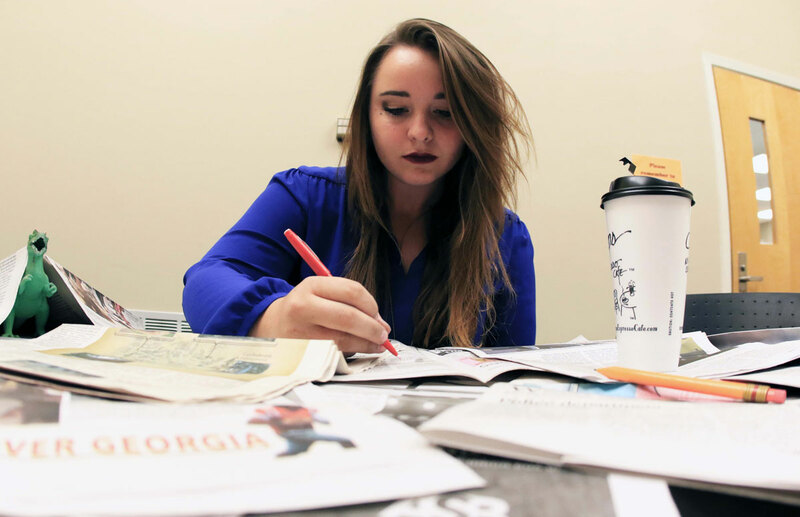 Daily Mississippian Editor-in-Chief Clara Turnage led the award-winning project during fall 2016. It highlighted the issue of sexual assault, which Turnage said she felt was under-reported on campus. She said many of the editors and reporters she worked with wanted to tell the stories of sexual assault that happened on their campus and in their communities. 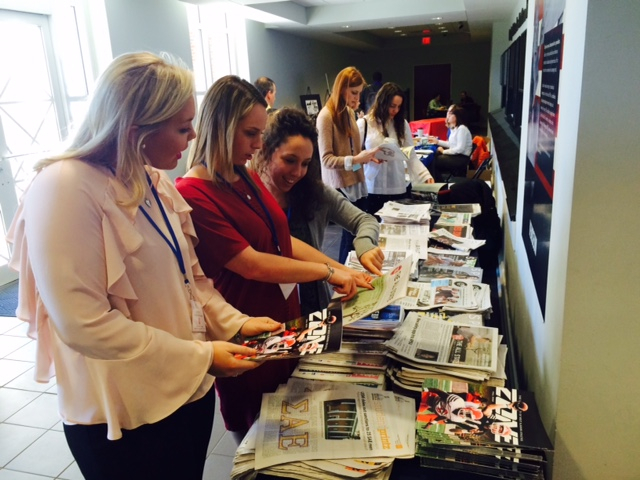 The University of Mississippi Student Media Center hosted this year’s conference. 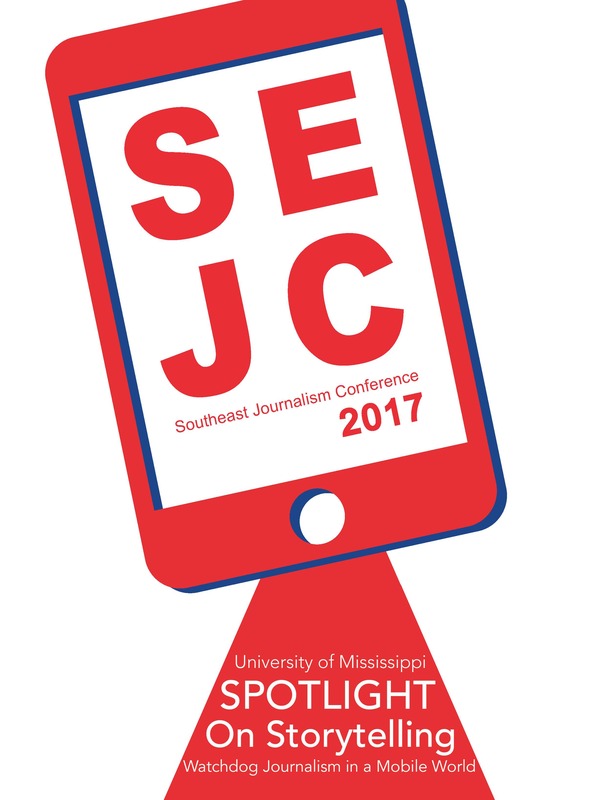 Its theme was “Spotlight on Storytelling: Watchdog Journalism in a Mobile World.” Meek School Assistant Dean Patricia Thompson was this year’s SEJC president. H. Will Norton, dean of the Meek School of Journalism and New Media, said he was truly proud of the Ole Miss students who participated in the conference. 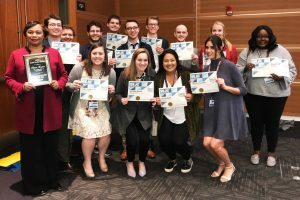 “Assistant Dean Thompson and her staff and the students of the Student Media Center provided a wonderful weekend for those attending and communicated excellence to everyone who attended,” Norton said. Conference speakers included Meek School faculty and journalists – including alumni – from The New York Times, Clarion-Ledger, ESPN’s The Undefeated, the Associated Press, Mississippi Today, Mississippi Public Broadcasting, E.W. Scripps, and other media companies. The Best of the South contest honored work published or aired between mid- November 2015 and mid-November 2016. There were entries from 29 universities across seven southeastern states. Turnage won second place in the prestigious College Journalist of the Year category. She was awarded a plaque and $500. Daily Mississippian Managing Editor Lana Ferguson won first place for magazine writing, and DM Lifestyles Editor Zoe McDonald won first place for feature writing. Second-place awards included: Hayden Benge, page design; Billy Rainey, radio reporting; Lauren Veline, journalism research paper. Third-place awards included: Lauren Layton, TV feature reporting; Daniella Oropeza, TV hard news reporting; Clara Turnage, special event reporter; Lana Ferguson, news writing; Marisa Morrissette, graphic design; Jake Thrasher, editorial artist. Other individual winners included: Julia Grant, fourth place, op-ed writing; Ellen Spies, fourth place, advertising; Brian Scott Rippee, eighth place sports writing. 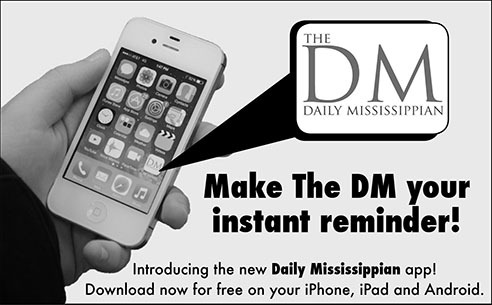 The Daily Mississippian, the only daily newspaper in the contest, won fifth place as best newspaper, and theDMonline.com won third place for best website. NewsWatch Ole Miss, a daily live newscast, won fifth place as best TV station. The Southeast Journalism Conference also includes onsite competitions, where students competed in 15 categories to produce content with tight deadlines. Georgia State University took first place in the Grand Championship Team Category. Belmont University and Southeastern Louisiana University tied for second place. As the host university, Ole Miss could not participate in onsite competition. Middle Tennessee State University tied for fifth place in the Grand Championship Team Category this year. Faculty adviser for the MTSU paper Sidelines Leon Alligood said his students have been to five SEJC conferences together. Bryce McNeil, assistant director of student media at Georgia State University, hosted the conference two years ago in Atlanta. “I was especially overwhelmed by how positive the speakers were in spite of so many clashes in the media,” McNeil said. He said this year he brought 29 students to Oxford, which is the biggest group yet to represent Georgia State at SEJC. He said these conferences have a lot to offer to journalism students. McNeil awarded Thompson a plaque of appreciation for her work as SEJC president. He said simultaneously running all the weekend’s events is very difficult, but Thompson did fantastic work during a fantastic conference. Harding University will host the next SEJC in 2018. Faculty adviser Katie Ramirez said this was her program’s first time visiting Oxford. Thompson said among the highlights for her during the conference were Jerry Mitchell’s keynote banquet speech, the support and help from Meek School faculty and other departments on campus, and the recognition of Ole Miss students’ work. “They are full-time students who work as journalists for hours every day and night because they care about our campus and community,” Thompson said. Upon meeting Leah Gibson at a conference in Washington, D.C., former Chancellor Robert Khayat and Meek School Dean Will Norton knew she would be an asset to the University of Mississippi. Gibson was a high school student at the time, and they recruited her. “After meeting them at the conference and learning about the programs available here, I then visited Ole Miss and fell in love with the station and all the opportunities I’d be able to have,” Gibson said. Gibson, a senior from Starkville, is majoring in broadcast journalism. In her freshman year, she auditioned for Rebel Radio and was hired as a DJ. She auditioned for NewsWatch and landed a role as a correspondent. Last year, she was a news correspondent for Rebel Radio. This year, in addition to serving as student manager for Rebel Radio, she is also a NewsWatch anchor. Gibson worked at Mississippi Public Broadcasting in Jackson as a radio news reporter this summer. She covered Mississippi current events, race relations, education and politics. Gibson’s plans for this year include more big events, talk shows, and much more. 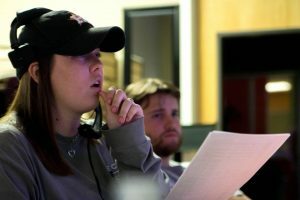 “I want to do a campus spotlight where I have interviews coming in every week, giving people direct connection to the station,” Gibson said. She is creating a training manual for her staff, and she produced a training video for the DJs. Gibson is passionate about music, saying that the right song can change a person’s mood, and she wants to be sure Rebel Radio gives that to its listeners. Gibson manages to do her radio and TV work in addition to her many other activities on campus, such as serving in the Columns Society and as an orientation leader. 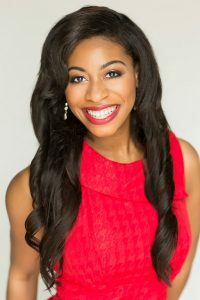 She was Miss Meridian in this year’s Miss Mississippi pageant, where she placed in the top 15 and won a talent award and was a finalist in the quality of life competition. 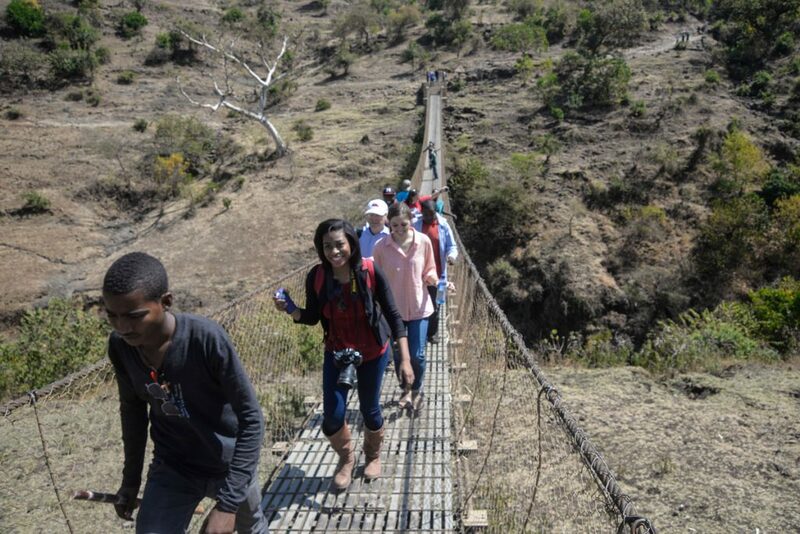 Leah Gibson and other Meek School students and faculty follow a guide across a bridge near Bahir Dar, Ethiopia, during a Winter Intersession 2015 multimedia project. Gibson will pursue a career in broadcast journalism or radio, and thanks the SMC for preparing her for her future. 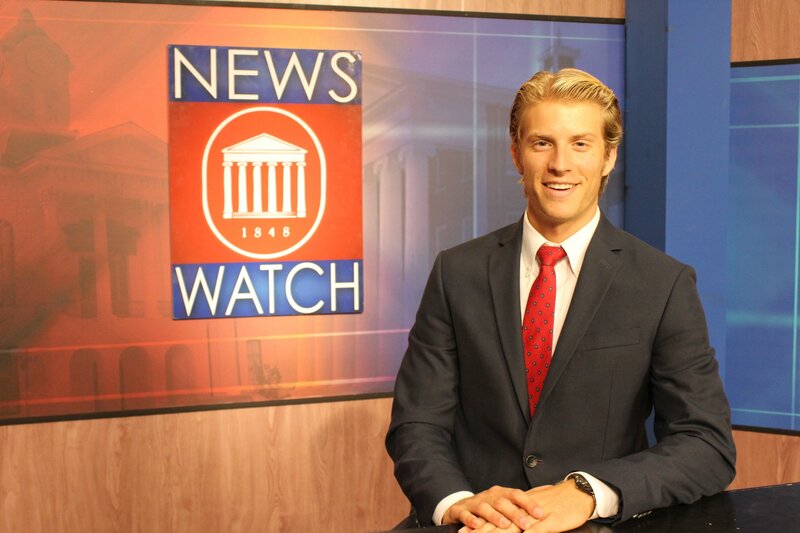 Payton Green had no idea what he was getting himself into when he joined NewsWatch his freshman year. 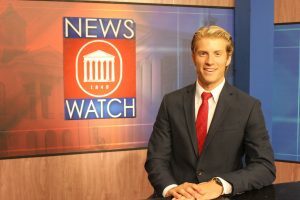 Now a senior, the broadcast journalism major from Pascagoula says he quickly realized that it was much more than that. “I was so scared on my first day,” he said, laughing. 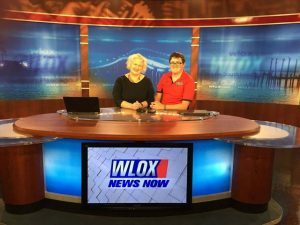 Payton Green and NewsWatch adviser Nancy Dupont on the set of WLOX-TV during Green’s internship in summer 2016. Fast forward a few years. Green recently traveled to New Orleans to accept a first-place national award for multimedia reporting from the Society of Professional Journalists. Green was part of a team of Meek School students who won the award for their coverage of the 10th anniversary of Hurricane Katrina on the Gulf Coast. Green worked as an anchor for NewsWatch for two years before becoming News Director, and fell in love with producing and “the behind-the-scenes thing.” He is serving as NewsWatch manager, in charge of the entire newscast, for fall semester 2016. Among the improvements Green has already made this year: new titles and job descriptions for his staff, an emphasis on more social media interaction, more local news and campus coverage, and more live shots from the field and the newsroom. Green’s favorite part of the SMC is seeing his student colleagues’ hard work pay off in a dream job. But he points out that it is not all hard work and no play at the SMC. Some of the goofiest moments end up giving them more insight into new ways to branch out on their show, he says. 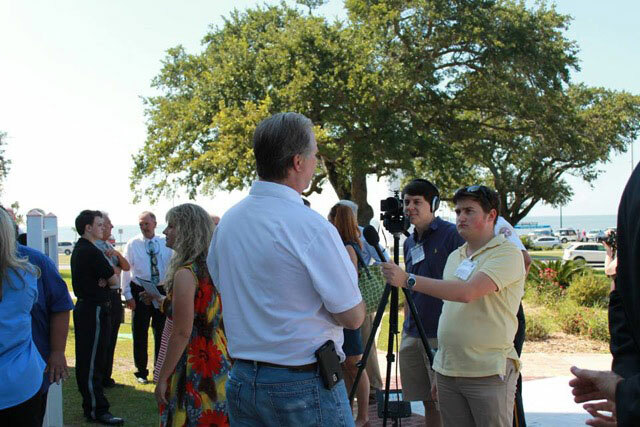 Payton Green interviews Biloxi Public Affairs Officer Jerry Creel during coverage of the 10thanniversary of Hurricane Katrina in August 2015. 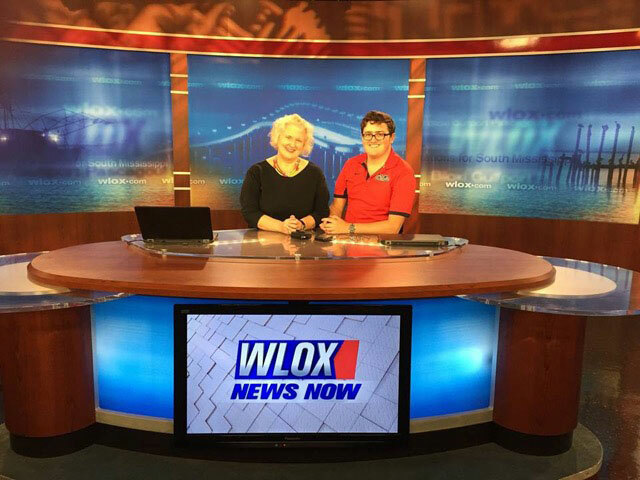 Green interned at WLOX-TV on the Gulf Coast this past summer. When he graduates in December 2016, he plans to get a job as a TV producer in local news. He would love to someday be a producer for Dateline or 60 Minutes. He is grateful to the SMC for giving him the skills to pursue his dreams. Photo courtesy Lindsey Lissau Photography. As she embarks on her year as Yearbook Editor, Cady Herring is no stranger to the SMC. Herring began as a freshman photographer for The Daily Mississippian, and later became DM photo editor. Last spring semester, she was co-photo editor of the yearbook. “I love news journalism and storytelling, and I believe that the yearbook is the perfect platform to creatively and eloquently document this year,” Herring said. Herring, a senior from Memphis, is a double major in print journalism and international studies, with a minor in Spanish. She has participated in several multimedia journalism projects during her years at the Meek School, in the Mississippi Delta and in Ethiopia. She has studied abroad twice in Africa and once in South America. This summer Herring spent a month in Tanzania in East Africa as the media intern for UM professor Laura Johnson’s National Geographic Society grant, Faces of the Mountain. She is currently communicating with the media team in Tanzania to edit final videos and working with National Geographic editors to submit content. 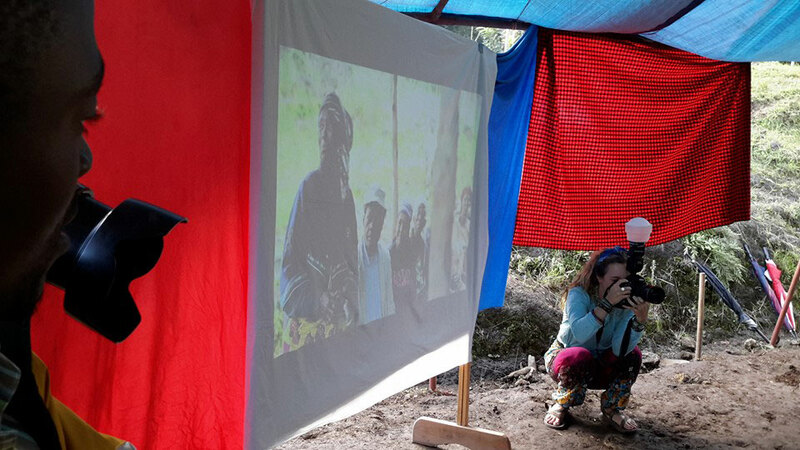 Cady Herring photographs the Mweka village presentation for the Faces of the Mountain project in Tanzania in summer 2016. 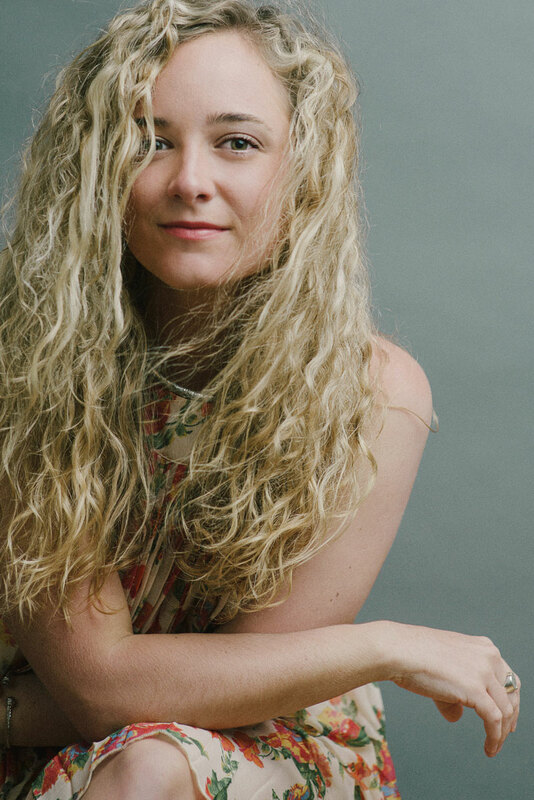 Student Media Assistant Dean Patricia Thompson noted that Herring has won national and regional awards for her photography and writing, including placing in the prestigious Hearst national journalism competition. Herring wants to use the yearbook to bring students together this year. “The Student Media Center has provided me with such an invaluable education that I wouldn’t be able to receive anywhere else,” Herring said. “It’s my plan to structure our staff like a team to foster that experience for other ardent students, so that this book will be a celebration of the amazing talent UM has to offer.” She and her staff are hard at work creating their theme and cover design, and they are planning events to reveal the theme later this fall. Herring graduates in May 2017, and is applying for internships and fellowships. She’s doing research this fall for her thesis about the relationship between the media and migrants, and hopes to continue using her storytelling skills in a career as an international documentary journalist. Overby Center Senior Fellow and Meek School instructor Bill Rose is a writing coach for the yearbook staff. He has worked with Herring on several Meek School in-depth projects. Making the decision to give the top advertising job this year to Ben Napoletan was easy. 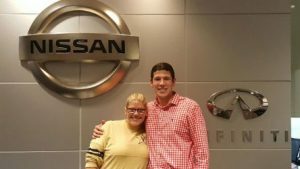 Ben Napoletan at his summer 2016 Nissan internship in Atlanta, with the company’s regional chief marketing and marketing analytics manager. Napoletan is a senior majoring in finance with a minor in marketing. He is from Alpharetta, Georgia. This summer, Napoletan interned with Nissan Motor Company in its southeast regional headquarters in Atlanta. He worked on analytical projects ranging from after-sales forecasting to dealership incentive programs. He says his favorite part of his SMC manager job is meeting monthly and annual sales goals. If they aren’t met, it just gives him even more motivation to work harder for the next month. 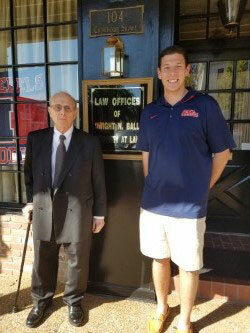 Ben Napoletan meets with Oxford attorney Dwight N. Ball, one of his Daily Mississippian advertising clients. “Sales has a scorecard, so the only thing that matters is how much revenue we bring in. It doesn’t matter if it is from one business or 100 businesses, as long as we earn the most money possible, that is the goal,” he says. Napoletan and his staff are creating video advertisements this year for the first time. And he is making his team work more efficiently by using call lists, which help his team avoid calling the same people twice. Napoletan plans to seek a sales job when he graduates in May 2017. Long term, he wants to be VP of sales for a Fortune 500 company. Clara Turnage knew on the first day of her freshman orientation in 2013 that she wanted to be involved with the Student Media Center. And even then, the persistence that makes her an outstanding reporter was evident. “I remember hearing about the DM at the first day of orientation, so I went by that day but no students were there. So I went back again and told them that I wanted to write and get involved,” Turnage recalls. The Sunday before the first day of classes, Turnage got a call from the DM editor in chief, giving her an assignment. Two days later, Turnage had a front-page byline. She was hooked. 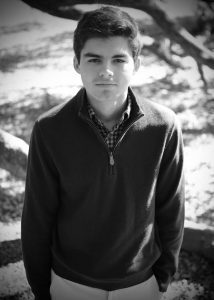 Turnage is a senior from New Hebron, majoring in print journalism. Her minor is an unusual one for a journalist: computer science. “ I became interested in computer science when Professor Deb Wenger asked if I would like to be in an Engineering Honors class that focused on the history of media systems,” Turnage says. “The class doubled as a computer science elective and the professor told me I should consider CS as a minor. I enjoyed what little coding we did in that class, and I valued the marketable skill I would receive with a computer science minor. So I decided to go with it.” It’s a skill she uses frequently to create timelines, website designs and other graphics. Turnage says she loves seeing her staff of writers and editors grow as journalists. She started at the DM as a writer and photographer her freshman year. In her sophomore year, she was promoted to lifestyles editor. She was promoted to managing editor at the end of her junior year, and that summer she also served as news editor and designer. Patricia Thompson, DM adviser and assistant dean for student media, has worked with Turnage every day for several years. Turnage is one of the best young journalists she’s ever seen. For the past two years, The Daily Mississippian has been named by the Society of Professional Journalists as one of the top three daily campus newspapers in the nation. In addition, Turnage has won several awards for her writing. This past summer, Turnage was a copy editor intern for the Arkansas Democrat-Gazette in Little Rock. The newspaper has one of the most sought-after internships in the country, receiving hundreds of applications for just a few spots. So far this year, Turnage has led a major redesign of The Daily Mississippian, and increased its social media and digital media presence. In mid-August, she led a new training program for her staff. 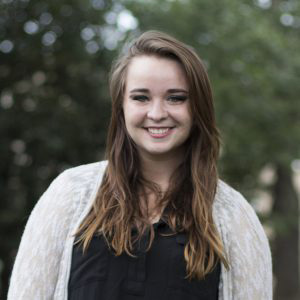 It’s her last year at Ole Miss, and Turnage reflects on her time at the Student Media Center as a blessing. Clara Turnage at work in the Daily Mississippian newsroom. At the start of fall semester, Turnage bought an air mattress sofa and often can be found sitting or lying on it, discussing stories with her staff or just hanging out with them as they wait for stories and photos to arrive for editing. While they have fun in and out of the newsroom, Turnage says that she and her team work hard to tell the University’s story in full – the good and the bad. They take seriously their mission to serve as campus watchdogs and to provide a forum for the exchange of ideas and information.